Facebook/ LCC K-9 Comfort DogsComfort dogs from Lutheran Church Charities have been deployed to Orlando. In the wake of Sunday’s mass shooting at Pulse nightclub in Orlando, several organisations and companies have stepped up to support the victims and their loved ones. JetBlue has offered free seats on flights to Orlando for the victims’ families. Chick-fil-A gave food to people waiting in line to donate blood. Eleven dogs from Northbrook Illinois’ Lutheran Church Charities (LCC) have been flown to Orlando, Buzzfeed News reports. The dogs and their 19 volunteer caretakers attended vigil for the victims on Monday night. The organisation doesn’t charge for its services and brings dogs wherever it’s invited. (The LCC dogs were also deployed to Newtown, Connecticut, following the 2012 Sandy Hook shooting, and to Boston, Massachusetts, after the 2013 marathon bombing.) 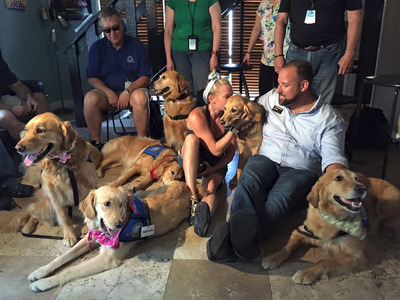 This time, the comfort dogs were invited to Orlando by Reverend Gregory S. Walton, president of the Florida-Georgia District of the Lutheran Church — Missouri Synod, according to a statement on the LCC website. The LCC comfort dog program relies on donations to cover all travel expenses. Here’s where you can donate to the cause.